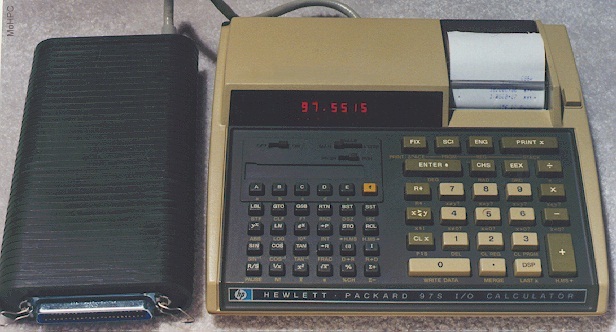 The HP-97S I/O calculator was a crossover from the personal calculators of the Corvallis Advanced Products Division to the larger calculators of the Colorado Calculator Products Division. It was a crossover in price as well, fitting nicely in the price gap between the two model lines. BCD interfaces were commonly used on instruments at the time and it was a natural for the calculator since it used BCD internally. There were 40 lines allowing10 BCD digits to be input in parallel or a single set of four lines could accept BCD character-serial data. Data entered could be integer, fixed or floating point. Besides the BCD digit encodings, the calculator also understood codes for the decimal point, sign change, Enter, EEX (enter exponent) and jump to label A. Depending on the interface design and programming, the calculator could be set to capture data when an external event occurred (load line triggered) or could sample data as needed with the pause command used to control the interval between samples. A jump to Label A was the only direct program control that a peripheral could exercise. However, since the calculator allowed duplicate labels and always searched downward from the current location, it was possible to have multiple input routines if needed. The manual provided wiring diagrams to connect to the calculator to various devices including those with floating point data, binary data, handshaking etc. An example circuit to decode 3 flag outputs into 8 output lines was also provided. The connector on the BCD port was a 50 pin Centronix style connector. (Like a full-size SCSI connector.) It could be connected to TTL, DTL, CMOS, NMOS and high threshold logic. Data could be positive-true or negative-true. Inputs were protected against overvoltage and static discharge. LOAD and LOAD' could be used by the peripheral to indicate that data was ready to be read. LOAD read on high and LOAD' read on low. Only one was typically used. For continuous sampling, LE' could be connected to LOAD' causing the calculator to load data as quickly as it could. INHIBIT had to be low for the interface to be active. The interface was inactive when INHIBIT was not connected. T/C' (True/Complemented) selected positive-true or negative-true data inputs. If left unconnected, a logic high was a one and a logic-low a zero. Load, T/C' and Inhibit all had internal pull-up resistors. Unconnected digits presented a NO-OP regardless of the T/C' setting.